While Integrated Health, formerly Allied Health, has been a part of the ASMBS since its inception in 1983 (with only 3 members), it wasn’t until 1987 that the first allied health program was introduced at the annual meeting. 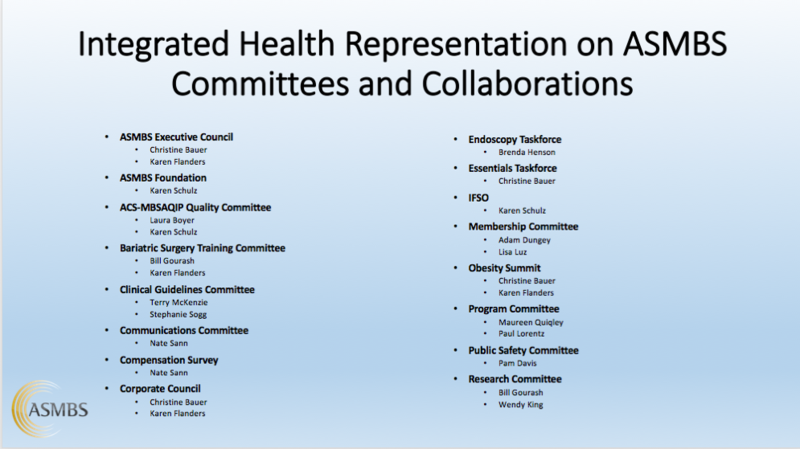 There were few attendees and the next program did not occur until 1991, when an official “Allied Health” committee was formed. The program was a simple roundtable discussion that included nurses, a psychologist, a program director, dietitians and an operating room technician. What started out as simple, but important exchanges of information between a diverse group of providers, has turned into data presentations, best practice guidelines and peer-reviewed articles. 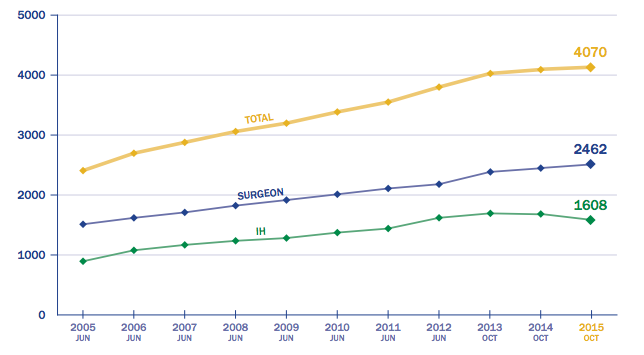 Between 2000 and 2015, the Integrated Health Section of ASMBS has experienced explosive growth. During this time, the number of Integrated Health members grew from 113 to over 1500 — a nearly 15-fold increase. But the numbers alone do not tell the story of the rise of Integrated Health in terms of its significance to metabolic & bariatric surgery and patient care. Increase awareness of the importance of an integrated multidisciplinary approach to the treatment of obesity. Optimize patient access to comprehensive and long-term bariatric and metabolic surgical health care. Promote a better understanding of the role of the integrated health professionals in bariatric and metabolic surgery. Be the recognized authority on the integrated multidisciplinary approach to caring for the bariatric and metabolic surgical patient. Improve outcome through the multidisciplinary approach that care for patient affected by obesity. Increase awareness of the critical role the multidisciplinary approach plays throughout the continuum of care. Optimize patient access to comprehensive obesity treatment. Promote best practices and an evidence-based approach to the treatment of patients affected by obesity. Cultivate and support a knowledgeable, skilled and empowered membership. Integrated health members see many benefits, from reduced registration fees at educational events to leadership opportunities at the local and national level. Visit our membership information page for more information on joining ASMBS.